It is never too early to just get started and to chase what you want! In fact, we have skills that we can use right now; they’re just difficult to quantify, especially if you don’t have much experience. Having difficulty identifying your skills doesn’t mean you don’t have them; your strengths will become clearer as you keep working towards what you want. And sometimes we don’t know that we’re capable of something until we go ahead and do it. Earlier this year at the IMPACT Conference, Simon Griffiths (founder of Who Gives a Crap), spoke about the concept of a minimum viable product. Popularised by Eric Ries’ in his book, The Lean Startup, the minimum viable product refers to what’s created at the start of a process of constant revision and innovation. First, you create something that works – and maybe just barely! It won’t be perfect, and probably won’t be totally ready to launch, but the main goal in the initial stage is to get feedback so you can see if there are any major flaws with what you’re developing, and if people are interested in it. After you get this all-important feedback, you can revise and upgrade your product, releasing it at each stage. Eventually you’ll have something awesome on your hands! Although it’s a business principle, you can also apply the minimum viable product on a personal level as you pursue your goals. What it comes down to is just starting! Start dates are just as important as due dates. If you chase perfection, you might never get your work out there for others to engage with. So here are a few actions that you can take right now! What are you waiting for? Networking is just a fancy word for talking to people! Making a genuine connection with others is more important than how many connections you have on LinkedIn or friends on Facebook. Be yourself and share what you’re passionate about with others! People love to see enthusiasm and will respond to your honesty. If you surround yourself with people who are inspired and passionate, you will become part of a supportive community of like-minded people. Make sure you’re doing what you really want and stay true to your own goals. You might have to pass up on other opportunities to focus on your path. Don’t compare yourself to others. Instead, collaborate with them! Try to connect with people whose work you admire so you can learn from them and apply that knowledge to your own pursuits. Goal-setting is a great way to track your progress and to evaluate where you are in the journey. Start with your short term goals – What do you want to achieve in the next week, month, six months? Make sure they’re achievable and don’t overload yourself with unrealistic ambitions! Move on to your long term goals – What do you want to achieve in the next year, in the next five years? Visualise where you want to be and what your daily life will be like. Make sure to actually write down your goals and put them somewhere you can see them! 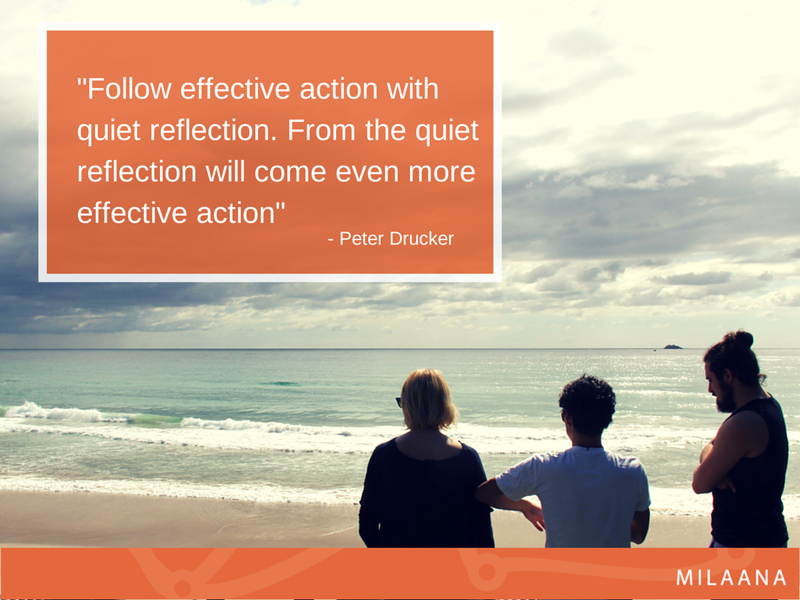 Take some time every now and then to reflect on what you’ve achieved and what you’ve struggled with. Reassess your strengths, weaknesses and interests and how they impact your goals. It’s hard to get started when you hold yourself standards that are too high! When you start your journey, don’t worry about everything being perfect! Just make sure you’re making some progress on your goals. Get your minimum viable product up and running (whatever it happens to be), then keep coming back and improving it. Whether your dream is to start your own community organisation, to be a writer, an academic or a painter, you can keep improving your work and building your profile. The most important thing is to JUST START! Feeling inspired? Why not head to www.milaana.org to check out the delightful projects we have on offer! 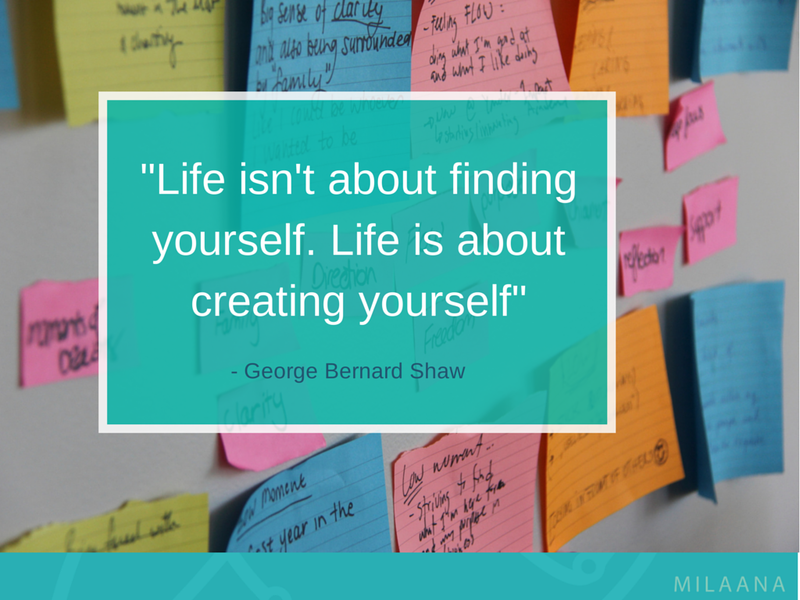 Finding yourself or creating yourself? What do you think?